The pool in Brooklyn Bridge Park New York is a pool with a view. If you happen to be in New York and you feel like a little relaxation in between all the sightseeing, head to Brooklyn Bridge Park for a refreshing dive in the Pop Up Pool. As the name reveals, the Pop Up Pool is temporary, so enjoy it while it’s there! 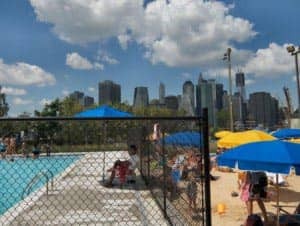 The freely accessible pool pops up every summer, from June onwards, and is to be found between Pier 1 and 2 in Brooklyn Bridge Park. The Pop Up Pool consists of a swimming pool (overlooking the famous bridge), a small beach with a limited amount of lounge chairs, picnic tables, showers and changing rooms. In the changing rooms you’ll find lockers, but you’ll have to bring your own lock. These are available at pretty much any supermarket. The bar at the beach is called Lizzmonade Brooklyn. It’s open from 10:00 until 23:00. During daytime they serve fresh lemonades and light snacks; from 6 on they also sell wine, quality beers and fresh fruit sangria. Coming from Manhattan it’s easiest to take the blue subway line (A or C) up to High St. (first stop in Brooklyn). From there on walk towards the Brooklyn Bridge. Enter the park at Pier 1 (Old Fulton Street) and walk through the park towards the left (so, away from the Brooklyn Bridge) until the Pop Up Pool pops up in front of you. Eric’s Tip: This is a great place to go. Also with children, because the pool itself is relatively shallow. And even if you don’t feel like swimming or sunbathing, it’s a good spot to just hang out for a drink, or to enjoy a hotdog after a walk in the park. If you don’t feel like the hassle of using a locker, go with friends or family who can guard your belongings while you’re swimming – and vice versa, of course.